William Hague was leader of the Conservative party from 1997–2001. He took over from John Major following the party’s defeat to Tony Blair’s Labour party at the 1997 general election but resigned after overseeing a comparable loss 4 years later. Renowned as an orator and parliamentarian, he was nonetheless dogged by public relations mishaps and his anti-European stance led to allegations of xenophobia from the left of his own party. He returned to frontline politics in 2006 as shadow foreign secretary under the new Conservative leader, David Cameron and in May 2010 became foreign secretary in the Conservative/Liberal Democrat coalition government. William Jefferson Hague was born on 26 March 1961 in Richmond, Yorkshire. He first came to public attention when he addressed the Conservative party conference in 1977. He went on to study politics, philosophy and economics at Magdalen College, Oxford University and became president of the Oxford Union and the university Conservative association. He then studied for an MBA at the INSEAD Business School in France and worked for Shell UK and McKinsey and Co.
Hague unsuccessfully stood for the Wentworth seat at the elections of 1987 but entered parliament 2 years later following a byelection in Richmond. He joined the cabinet in 1995 as the secretary of state for Wales. Following Labour’s victory at the 1997 elections, John Major resigned as leader of the party and was succeeded by Hague, who defeated Kenneth Clarke after three rounds of voting. While leader of the opposition, Hague also became chairman of the International Democratic Union, an organization of which he remains deputy chairman. Hague won many plaudits for his consistent performances against Blair at prime minister’s question time. However, he lost popular credibility after a series of publicity stunts misfired, including being pictured wearing a baseball cap and claiming to have drunk ‘fourteen pints a day’ in his youth. The Conservatives remained split over Europe and Hague’s personal European scepticism drew criticism from influential Conservatives such as Michael Heseltine. When Hague oversaw only a single seat gain at the 2001 general elections, his resignation soon followed. While remaining an MP, Hague explored other business interests and became a regular face in the media. He also wrote a well-received biography of Pitt the Younger (to whom Margaret Thatcher had compared him in 1977). Hague’s favoured successor, Iain Duncan Smith, took on the party leadership but oversaw the parties continuing stagnation and was succeeded by Michael Howard in 2003. After a third unsuccessful election, Howard gave way to David Cameron, who appointed Hague as shadow foreign secretary. Consequently, following the Conservatives’ return to power in May 2010 he was made foreign secretary in Cameron’s first cabinet. Shortly after his appointment, Hague outlined a foreign policy in which the UK would obtain ‘greater reach and influence’ in an increasingly fast-paced and ‘networked’ world. The Arab Spring protests throughout the Middle East in 2011 presented Hague with his earliest and, arguably, most significant diplomatic challenge as foreign secretary. Whilst maintaining a critical stance towards the autocratic administrations of Libya’s Muammar Gaddafi and Bashar al-Assad of Syria, he called for a peaceful resolution to the violent uprisings around the region. Nonetheless, Hague backed airstrikes co-ordinated by NATO against the Libyan regime and clarified the UK’s recognition of the rebel Libyan council as the country’s ‘sole governmental authority’ in July 2011. This trend in UK foreign policy would continue in Feb. 2012 when Hague announced his government’s recognition of the Syrian National Council as the legitimate representative of Syria. 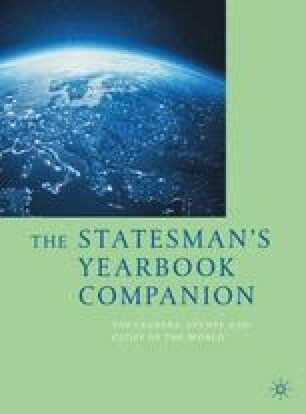 In July 2014 Hague’s time as foreign secretary ended following the most extensive cabinet reshuffle of David Cameron’s premiership. He remained within the cabinet, however, becoming leader of the House of Commons in the same month. Hague subsequently announced his intention to leave parliamentary politics following the general election in May 2015. He vacated the seat he held for 26 years as representative for Richmond, North Yorks in March 2015 and stood down as leader of the House of Commons and first secretary of state in May. In Sept. 2015 Hague was appointed chairman of the security think tank, the Royal United Services Institute.